Winch Straps and Tie Down Straps are the most important pieces of hardware for holding down loads. While the Tarp protects the loads from the elements, it is the high tension in the straps that keeps the load in place. The winch straps that we offer are weather resistant, durable and able to hold down and control loads on flatbeds. In the entire system, the winch straps have to be capable of handling the high tension. We provide a wide range of tie-down straps such as ratchet tie downs amongst others which are used by Drivers in locations on the rail that do not have a bolt on winch. We provide a wide selection of Winch & Ratchet Straps and other corner products. 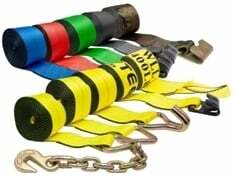 All our winch and ratchet straps are made with heavy duty webbing and meet DOT regulations and WSTDA recommended standards. We also supply accessories like Bolt-On Winch, Sliding Winch and Winch Bars.